Byron: Nationalist? Citizen of Nowhere? Monday 15th July, 2019 5.30pm National Library of Scotland, Edinburgh. Tickets must be purchased in advance, and will be available to purchase from the 18th of June. 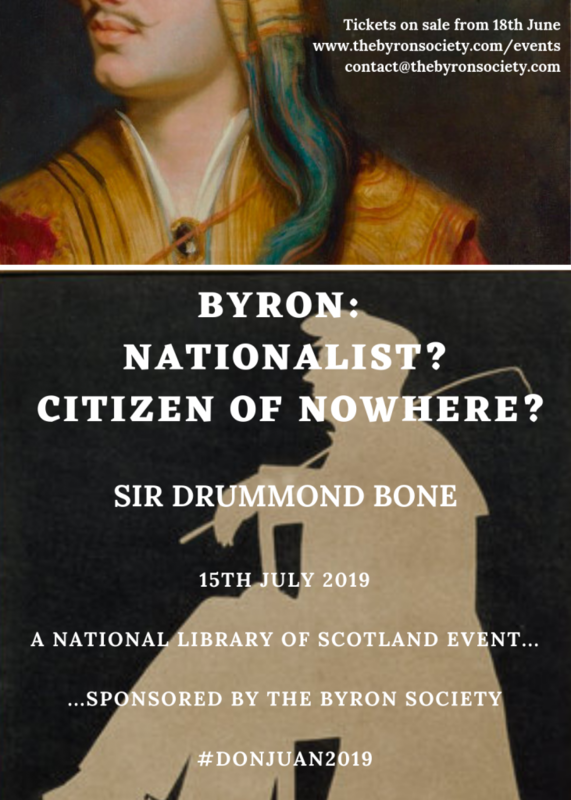 A National Library of Scotland event sponsored by the Byron Society. Celebrating the Bicentennial of the publication of the first two Cantos of Don Juan, this talk by Sir Drummond Bone is part of the National Library of Scotland’s 2019 exhibition around Don Juan and the John Murray Archive. That Byron supported peoples against Empires scarcely needs saying, but what he meant by way of a nation is more difficult to assess. The ‘nation-state’ certainly implies a citizen’s responsibility as well as a collective identity – the core idea behind charging the cosmopolitan with having none. Was he really thinking of that at all? His tolerance of and interest in a whole panoply of different cultures, not to mention his being ‘born for opposition’, makes his own rootedness pretty impossible to define (let alone the Anglo-Scottish genes), while his normal but not exclusive insistence on the individual rather than the collective makes citizenship at best a pretty fluid state. And this nest of contradictions plays out in the poetry – in the late dramas in terms of content, and in the great Ottava rima poems in terms of their form, as well as in his own musings on what poetry and drama should look and sound like. Serious issues, but with Byron it doesn’t do to be entirely serious. Tickets go on sale on the 18th of June. 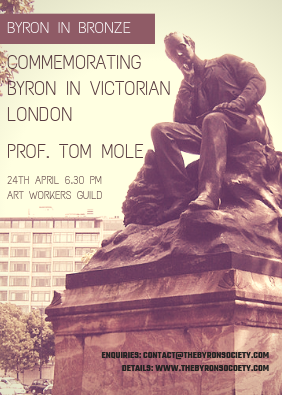 Please let us know if you would like to attend, email contact@thebyronsociety.com. The Byron Society invites applications for a PhD bursary for a PhD on any aspect of the life, work and /or influence of the poet Lord Byron.